Who doesn’t like house plants? They clean the air in your house. House plants have been known to help prevent and combat depression. And most importantly, it feels like they bring a real sense of coziness to a home. Did you know you can take your favorite house plants and multiply them virtually for free? 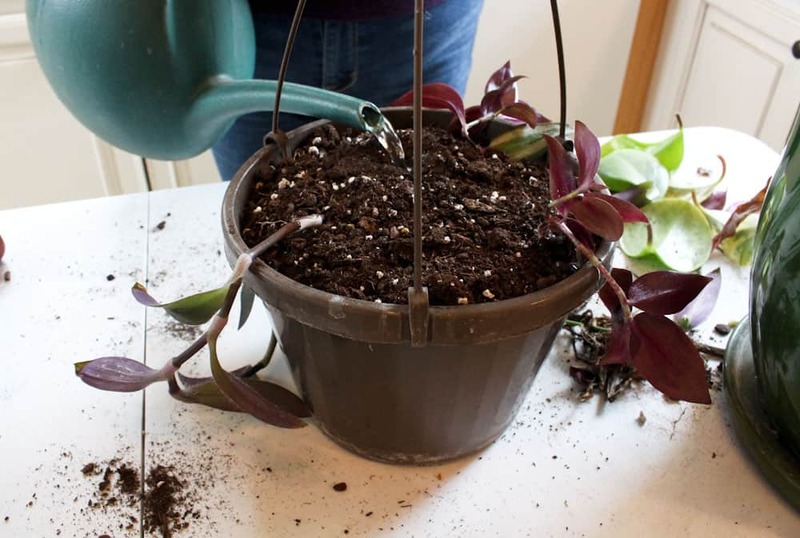 Follow these easy steps on how to create hanging baskets from house plant cuttings. 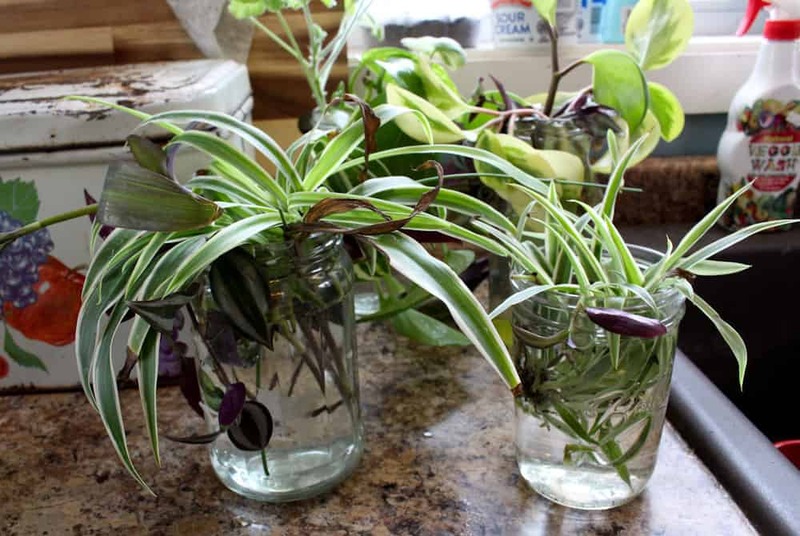 What Kinds of House Plants do you Have for Taking Cuttings? We have several house plants that we would like use to create hanging baskets for our front porch. 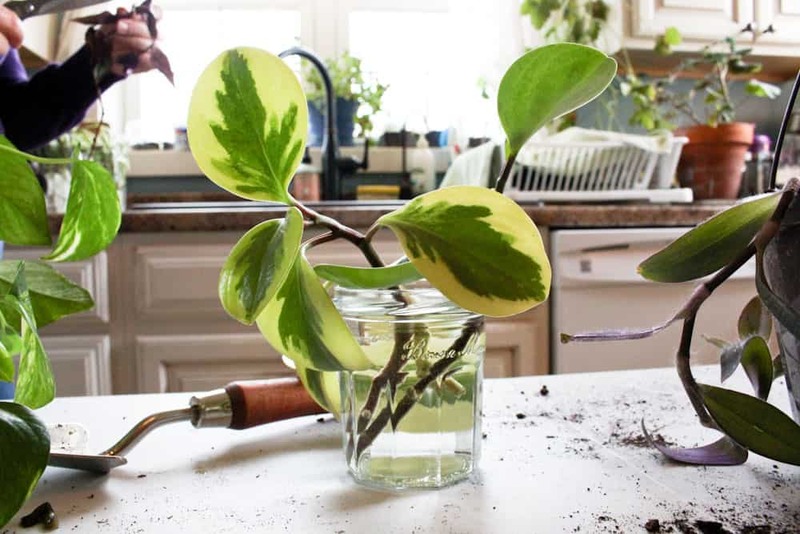 Most house plants can be started from cuttings. 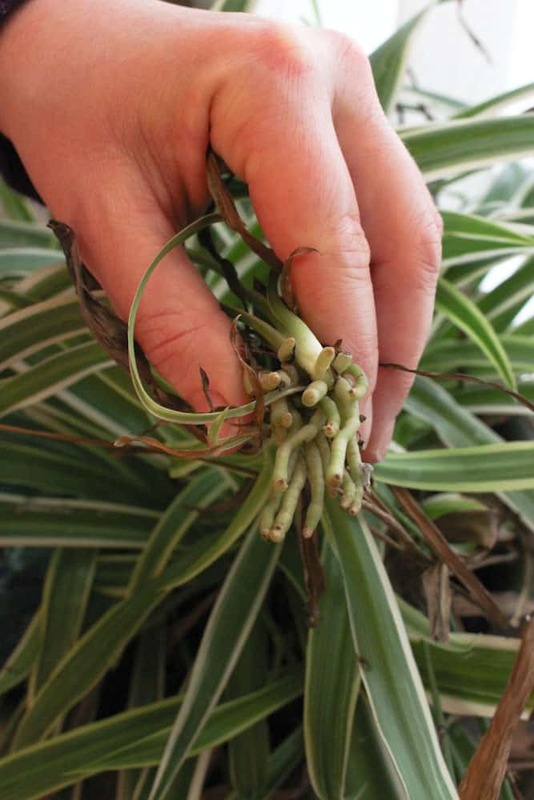 For example, Spider Plants produce small root systems, or baby plants, along their hanging tendrils. This makes it very easy to start new plants. 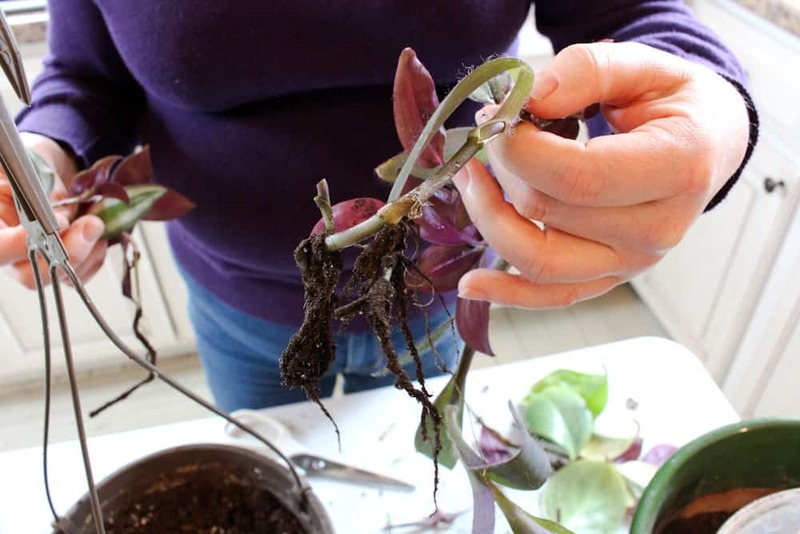 Others house plants, like Wandering Jew, Philodendron, and Purple Queen, have root nodules along their stems. These nodules are places where the stems can be cut to start roots. 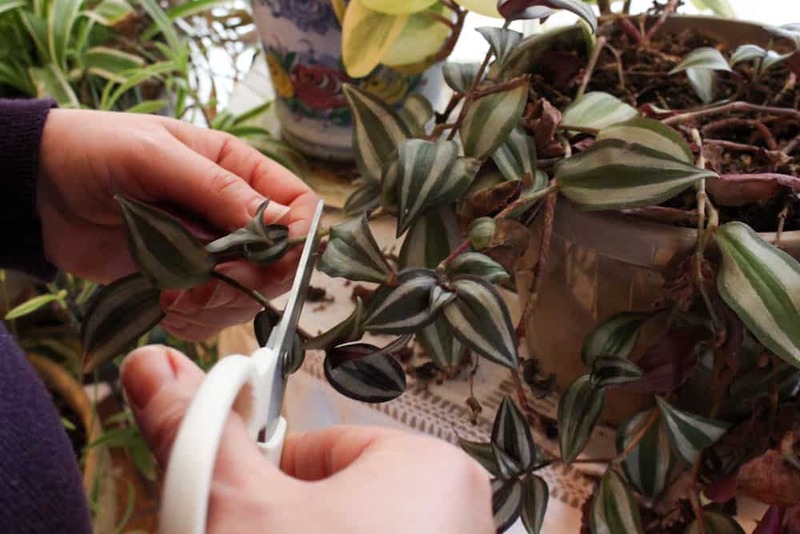 Start by gathering your tools for the plant cuttings. You will need your mother plant, some scissors, and a recycled jar or small glass vase with water. Choose the stems from your mother plant that will make nice cuttings. Stems that need to be pruned make really nice starts. Also, stems that have been knocked off, damaged, or pulled off by little ones work well for cuttings. Cut your stems at an angle, which makes a larger surface area for water to enter. 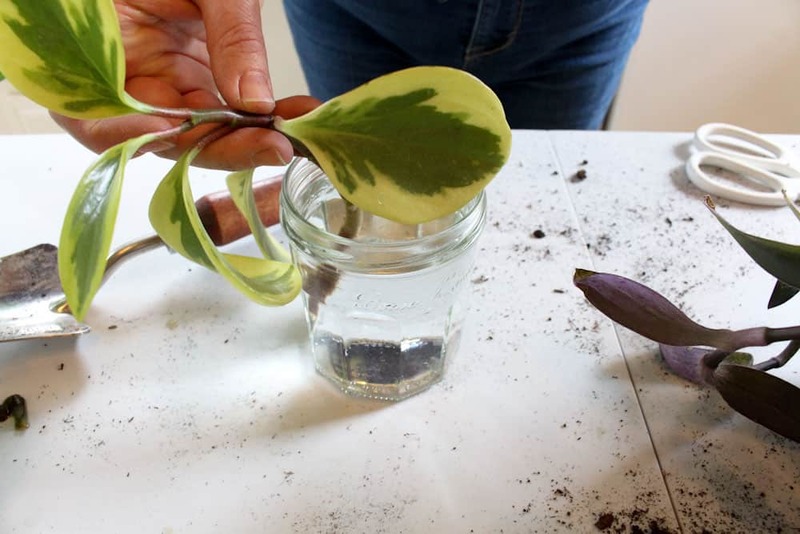 Trim away any excess leaves that will be below the surface of the water when you put the stem into the jar. Excess leaves will rot and promote algae growth (aka green slime), therefore those should be trimmed away. After the stems have been placed in the water, allow them to sit for 2 – 3 weeks until they produce roots. Make sure to keep plenty of water in the jar because they will drink a lot! Now to actually create your hanging baskets from your house plant cuttings! We suggest using recycled hanging baskets for this project. We have several left over from the last few years that we will be using again for these plant starts. In the past we have gotten free hanging baskets from friends and family. We have even gotten old baskets from dumpster diving. You may also be able to find them very cheaply at your local thrift stores this time of year. Fill your basket about half way with soil. 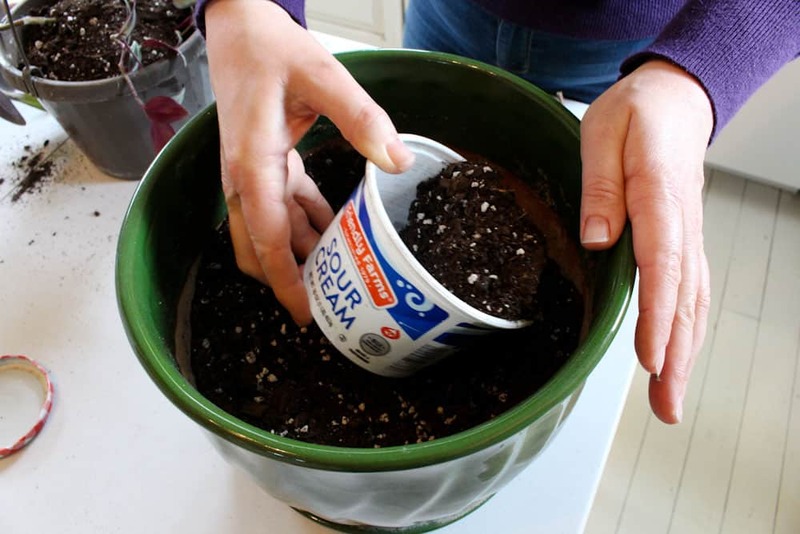 Take your jar of newly rooted house plants and place four or five of the starts into the soil, roots down. Once your plants are in place, cover them the rest of the way with soil. Water the plants well, and place them in the appropriate amount of sunlight. This will depend on the plant type- some prefer sun, some prefer shade. The plants need 3 – 6 weeks to fully reach establishment. Be sure to keep them well watered. They will eventually fill in and become lush and beautiful. These are wonderful for placing on the porch to enjoy throughout the summer months. When the weather cools off in the fall, you can simply bring them into the house to be house plants again! You need to start on your hanging baskets early in the spring. 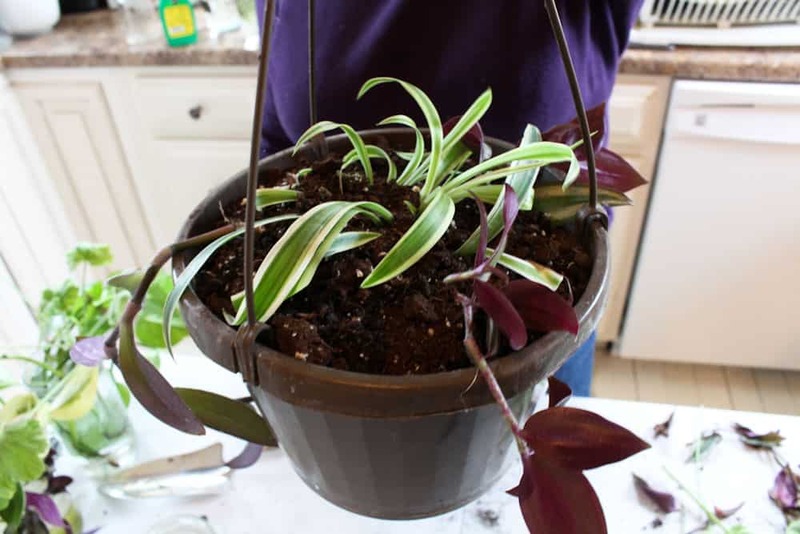 This way you can enjoy creating hanging baskets from your own house plant cuttings all summer long! Other than creating new plants from cuttings totally for free, here some other frugal tips. First of all, use recycled materials! Pickle jars work great for helping cuttings produce roots. You can use plastic hanging baskets again and again each year- no need to buy new! Finally, you can also recycle soil! Some people say to avoid recycling soil, but we have done it for years without any issues. 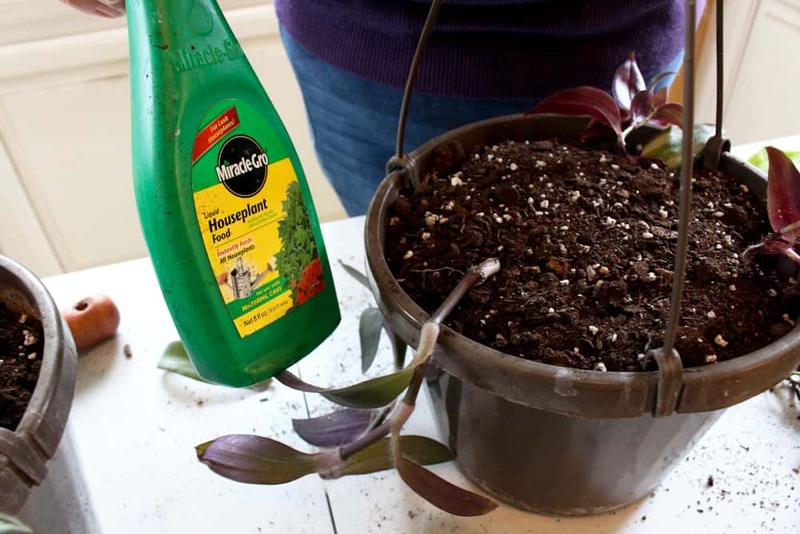 There are a few tips to make it work: Remove excess roots, branches and leaves from the previous plant. Those can promote the growth of disease and fungus. You can also cut in a bit of new soil with the old soil if needed. Lastly, one problem with old soil is that sometimes the nutrients have been depleted over time. It is a good idea to add egg shells to older potting soil. And above all, FEED, FEED, FEED! House plants need to be regularly fed with plant food. For other tips on starting plants from cuttings click here. Be sure to let us know how your hanging baskets from house plant cuttings turn out!